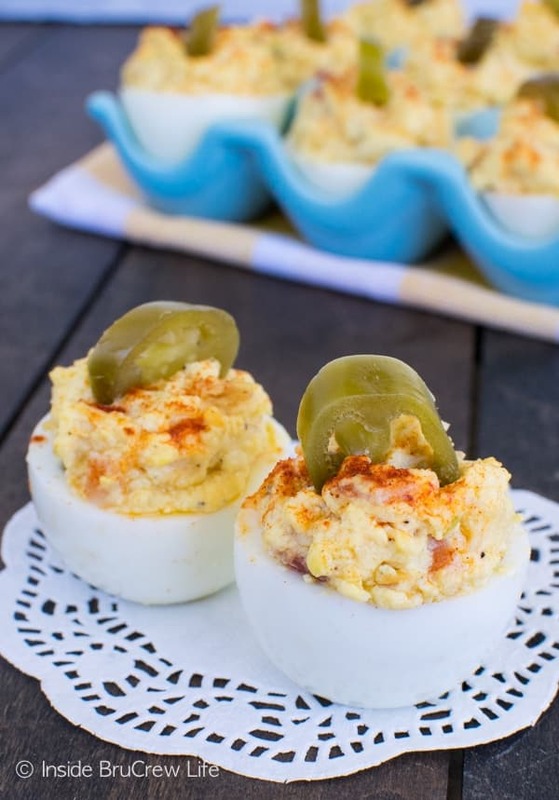 These Loaded Bacon Jalapeno Deviled Eggs are the perfect picnic appetizer. 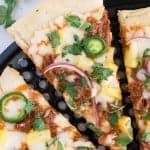 Bacon, cheese, and bits of spicy peppers give the egg filling such a great taste and texture. Right after we moved to Texas we were invited over for dinner from a couple in the church. When we got there they had appetizers ready for us to eat before having dinner. One of the appetizers were smoked jalapeños filled with cheese and wrapped in bacon. My husband went nuts over them! 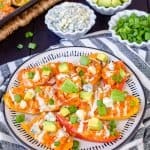 These peppers were very similar to these bacon ranch grilled jalapeños that we did a few years ago. Bacon wrapped around the outside made these a little different. 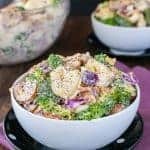 Can you guess what my husband has been making and eating on the weekends? You got it. Jalapeños (and mushrooms) are now his favorite thing to make on the grill. Smoked mushrooms and peppers stuffed with cheese do make a pretty tasty dinner. 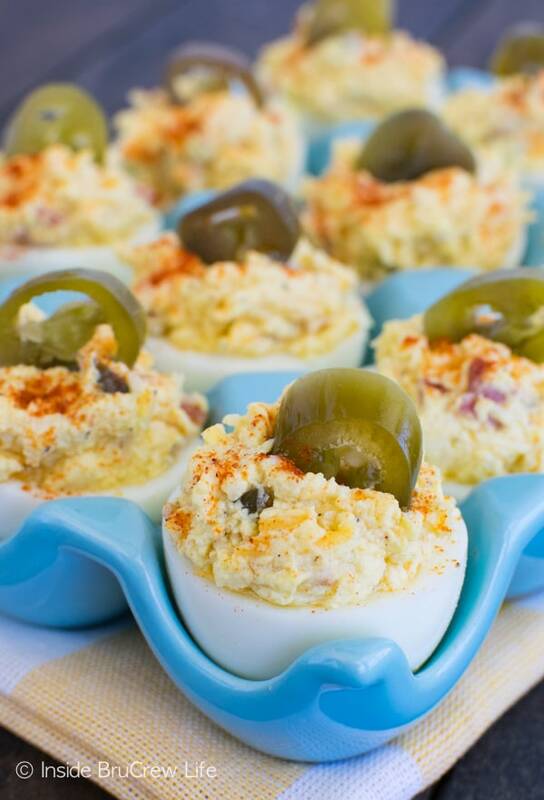 Deviled eggs are a must at our picnics and dinners. Is is that way with your picnics too? Most of the time I am a big fan of the plain eggs, but adding bacon and cheese was a good idea. Eggs loaded with those ingredients are definitely man-friendly. I have all the food groups a man loves covered, right? I am so thankful for a husband that loves our family so much. He is such a great role model for our kids and for me to follow. We are blessed to have him be part of our life! Buy eggs a week or two before making them because they peel better after cooking, if they are older. Chill the eggs in cold water right away to stop them from cooking. Cut the eggs sideways, instead of longways. The filling is hearty, so the eggs will hold up better this way. Slice off a tiny ring on the bottom of each egg cut, so they stand up by themselves. Use a spoon to pile the egg filling in. Top each egg with some smoked paprika and a pickled jalapeño slice, just to make it pretty. 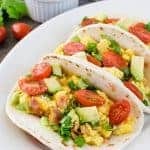 Looking for more ways to use up eggs? 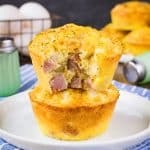 These Bacon and Egg Breakfast Cups would be a great addition to any brunch. 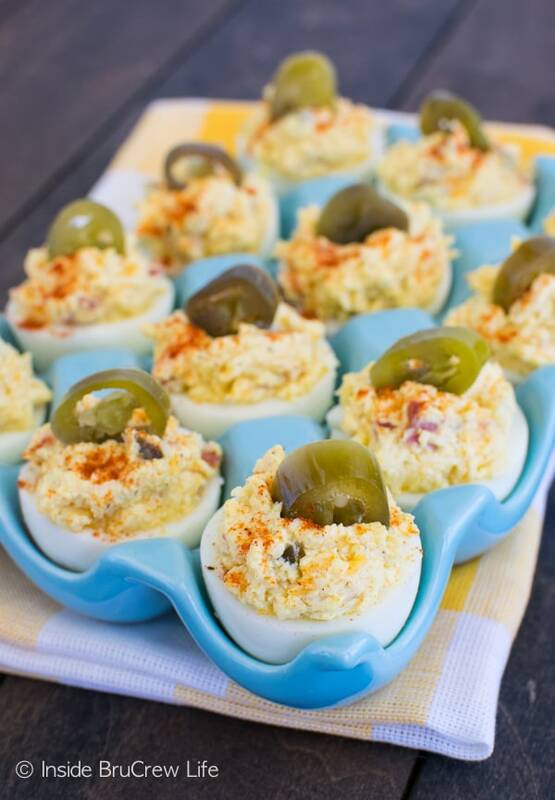 I’m totally drooling over these Dill Pickle Deviled Eggs. Holy yum!!! And these Angel Eggs are just like grandma used to make!! 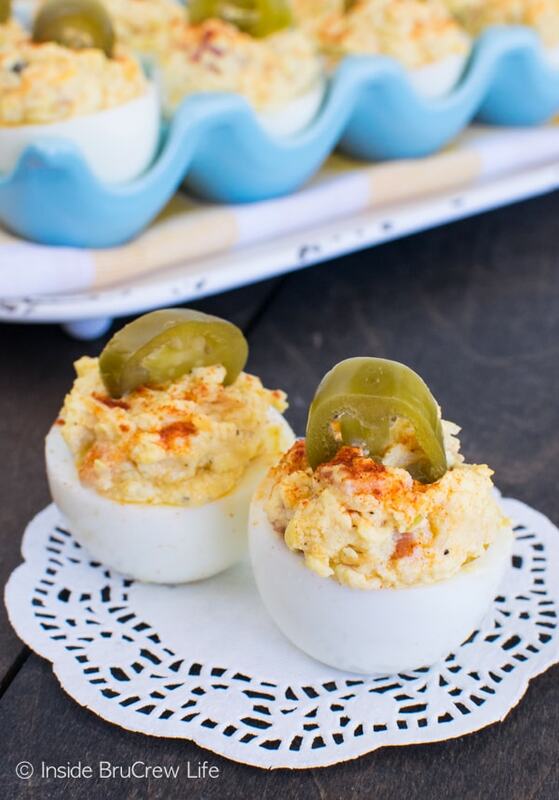 These Loaded Bacon Jalapeno Deviled Eggs will be a fun addition to your summer picnics. 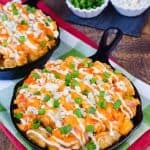 Cheese, bacon, and peppers adds a great flavor to the filling. Cut the eggs in half side ways to make little egg cups. Remove the yolk gently and place in a bowl. Slice off a tiny circle from the bottom of each egg, so the cups will stand up. Dice the egg yolks with a fork, and then add the softened cream cheese, salad dressing, garlic, and mayo. 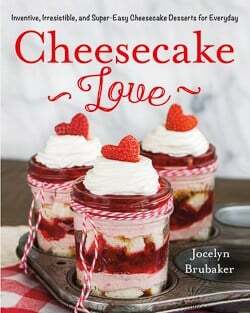 Mix together until creamy. Stir in the diced jalapeños, cheese, and bacon. Season to taste with the salt and pepper. Use a spoon to fill each egg cup completely with the mixture. Sprinkle with the smoked paprika and top each egg with a jalapeño slice. Refrigerate until ready to serve. BTW where did you buy your blue egg dish…..it is beautiful ?